So I guess we can all look forward to watching Ryan Fitzpatrick play quarterback for the Jets one more time this Sunday. He gets the start because Bryce Petty–the man Todd Bowles reluctantly chose to replace a horrendously bad Fitzpatrick several weeks ago–separated his shoulder in the Jets’ latest embarrassing loss, a Christmas Eve annihilation at the hands of Tom Brady and the New England Patriots at Gillete Stadium in Foxborough, Mass. Speaking of Bowles, he rushed back from the hospital to coach this game after suffering from gall bladder and kidney stone issues just so he could watch this pathetic excuse for a football team completely quit on him yet again. With their season having been over for weeks, the only reason to watch the past few Jets games was to see and evaluate the performance of second year quarterback Bryce Petty. Spoiler alert: the results were not good. In the span of four starts (and some relief action) this season, Petty managed just three touchdowns to seven interceptions while generating a quarterback rating of 60, the lowest of any passer in the league who started more than one game in 2016. He flashed a big arm at times and showed plenty of toughness, but his complete and utter lack of pocket awareness combined with an inability to get beyond his primary read exposed once and for all what many believed would be the case for Petty coming out of Baylor two years ago: his NFL ceiling is that of a marginal backup, not a legitimate starter. Still, fans were happy to see him play because the playoffs were out of reach, Fitzpatrick was certainly not the answer, and quite frankly, despite what most expected of him, in a world where Tom Brady, Russell Wilson, Dak Prescott, and Tony Romo exist, you really never know. But there’s still one guy on the Jets roster we don’t know about, and that’s what makes Bowles’ decision to go back to Fitzpatrick following the injury to Petty so puzzling. The Jets selected Christian Hackenberg in the second round of the 2016 NFL draft. Hackenberg, a Penn State product, was widely praised as a possible future #1 overall pick after a terrific freshman season under Coach Bill O’Brien, in which he threw 20 touchdown passes and accumulated a passer rating of 134. But after O’Brien went to the NFL and James Franklin took over, Hackenberg greatly regressed the following two years, struggling mightily with accuracy (collective 2014/2015 completion percentage south of 55%) and decision making (21 INTs in 26 games). His stock dropped so much that some scouts felt he wasn’t even draftable and many draft experts had him going in the mid-late rounds. The Jets felt differently, selecting him 51st overall, with General Manager Mike Maccagnan telling fans and media alike he was confident the team’s coaching staff–most notably offensive coordinator Chan Gailey–could turn Hackenberg back into the guy he was his freshman year. We were told he would be brought along slowly, taught the system, and then eased into the lineup next season after a “redshirt” year in 2016. But things don’t seem to be going according to plan. Numerous reports all throughout the year have indicated that Hackenberg is nowhere near ready to play, despite going through an entire training camp, pre-season, and 15 games of regular season action. I’m not saying he should be Troy Aikman just yet, but you’d think he would have learned something by now, no? Or at least enough to start at quarterback in a meaningless week 17 game–a glorified pre-season game in many respects–at home against a team who just fired its coach and likewise has zero chance of making the playoffs. And if the plan is for Hackenberg to start in 2017, is it really THAT MUCH of a leap to let him play Sunday? If he shouldn’t be anywhere near stepping on the field now, are things REALLY going to be so drastically different after a few months of training camp next season? Still, Bowles insisted that his young signal caller not only won’t start against Buffalo, he doesn’t see a scenario– outside of injury, obviously–in which Hackenberg will get in the game at all. Organizationally, the Jets are steadfast in their claim that this is all part of their long term development for Hackenberg, with Gailey still maintaining that “the sky is the limit” for him. But Brandon Marshall, in his seemingly never-ending quest to be a “team player,” may have inadvertently given the game away with comments he made over the past few days. “Why would you want to do that to that kid?” he asked, while further lamenting to Newsday that there used to be a time when young quarterbacks could sit and learn and he should stay on the bench and absorb every bit of knowledge from Fitzpatrick. Hilarity of recommending anybody study how to play quarterback in the NFL by sitting and watching Ryan Fitzpatrick–the football equivalent of learning the job of New York City Mayor from Bill de Blasio–aside, while what Marshall said sounds nice in an ideal world, but that simply isn’t the way the NFL works in 2016. As ESPN’s Rich Cimini pointed out, since 2008, 35 quarterbacks have been selected in the first or second rounds of the draft, and assuming Hackenberg sits the entire game Sunday, he would become only the second of those 35 to not throw a single pass his first season in the league (the other was Brian Brohm, whom Green Bay picked in 2008, but at the time, he was sitting behind both Brett Favre and his heir apparent, Aaron Rodgers). The truth is, like it or not, early round draft capital is so important that a team simply is not going to use a day one or two pick–considered the most precious of resources in today’s NFL–on somebody they don’t feel at least has the potential to play at some point in year one. It is one thing to do what the Jets did with Petty, who was a fourth round pick with no real expectations of success. However, to do it with Hackenberg meant missing out on several immediate impact players like linebacker Deion Jones, guard Cody Whitehair, or cornerback James Bradberry, all of whom went a few picks after Hackenberg and are already contributing in a major way to their respective teams. Which of course leads back to Marshall’s original implication that putting Hackenberg on the field Sunday would be something akin to abuse. 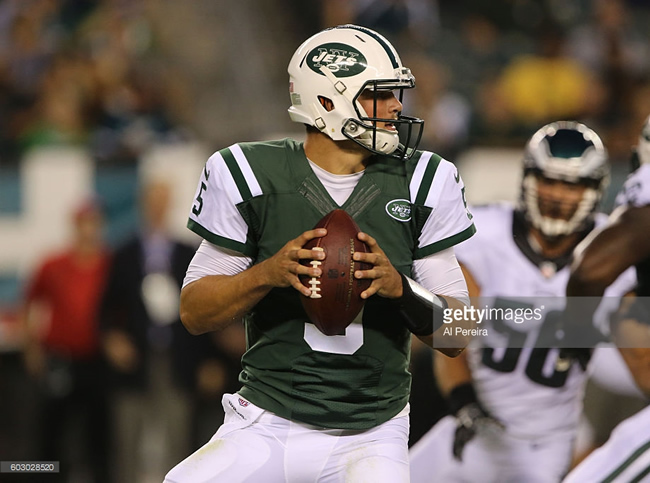 Marshall walked that back the following day –likely after he realized his quote was too truthful and could be damaging to team management–claiming that of course Hackenberg is ready, but the goal is to win games and Fitzpatrick is better suited to do that right now. A nonsense argument, given how horribly Fitzpatrick has played this season and the fact that Petty, who was even worse, started a string of games before his injury. But hey, at least Marshall tried to dig himself out of the hole his honesty created. Really, despite all the talk of “sticking to the plan” and “trying to win games,” there is one reason and one reason only that the Jets are trotting Ryan Fitzpatrick out there to get mercilessly booed by the undoubtedly sparse crowd at Metlife Stadium Sunday. They are scared to death. Not so much afraid that Hackenberg won’t play well. I think it is fairly clear they expect that. No, they are frightened to their core that other people will finally get to see his poor play for themselves–rather than reading about it secondhand from media sources–and realize just how badly they were mistaken to have drafted him where they did. It is painfully obvious at this point that Jets coaches and management comprehend that for all their flowery language about his potential, Christian Hackenberg is a sunk cost. He is not ready to be an NFL quarterback and he never will be, and they know it. By not playing him Sunday, Jets brass gets to stall for time and formulate another plan. Whether that means trading up in the draft for a quarterback, going after a quick fix like Tony Romo, a journeyman like Brian Hoyer, or an intriguing talent like Tyrod Taylor, not allowing the public to see, in living color, that they more or less flushed a second round pick down the toilet for a guy who cannot play, gives them a chance to do something that at least changes the subject and redirects the public’s focus away from their failure before next season starts. After all, it is a lot easier for fans and the media to just forget that Hackenberg even exists if they never actually see him and he gets circumvented by somebody far more glamorous. So, we will continue to hear all about the great Christian Hackenberg development plan and how much potential he has because that was the lie the Jets sold themselves and everybody else when they inexplicably talked themselves into drafting him so high in April. And much like Slim Charles said to Avon Barksdale, once that lie is told, sometimes you find yourself in so deep that you have no choice but to keep fighting on that lie, whether you like it or not. Of course, the flaw in that logic is that, generally, you can only fight on the lie for so long before the chickens come home to roost and everything crumbles around you. For Avon Barksdale, that eventually meant spending the rest of his days in prison. And if Bowles, Maccagnan, and the rest of this current Jets brain-trust don’t figure out a way out of this Hackenberg mess pretty soon, they will have plenty of time on their hands to watch all five seasons of “The Wire” and reflect on how their “big lie” cost all of them their jobs.